You can find us at every Saturday at the St. Joseph farmer's market with a variety of organic heirloom vegetables, flowers, herbs, and plants. Come visit us to see our selection. We offer your traditional produce as well as unique items. No matter what you choose you will be sure it will look beautiful and taste amazing. That comes from the great care that we take to grow everything on our farm the natural way, no chemicals of any kind. Our produce will also be available at Clear Water Meats Farm Market in Eau Claire. A great destination for those looking to get local meats pasture raised. An excellent option when looking to get your full meal in one stop. ​You cannot beat their meat, IT IS GREAT!!! If you cannot make it to us at the Farm Market on Saturday's be sure to stop by our farm stand. Located on Naomi Rd by the Pipestone Creek golf course. We take the time to grow vegetables the way we want our kids to eat them. We buy heirloom seeds from reputable sources we can trust and all of our produce is grown without any chemicals. Below are some of the MANY vegetable varieties grown on our farm. As I like to say don't ask me what vegetables we grow, it will be quicker to tell you what we don't grow. 2016 was our first year growing radishes and they are addicting. 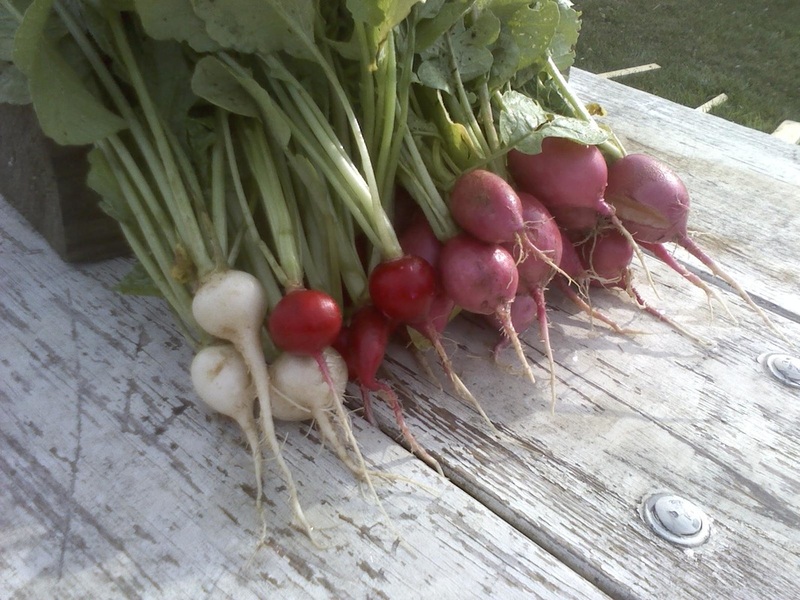 Radishes are one of the few crops to ripen within a month (usually 3 weeks). Our oldest son always loves when carrot's are in season. He pulls a couple every day for his rabbits to enjoy and boy do they! Summer squashes such as zucchini or crook neck yellow squash are a must have. They are one of the first main crops to come in and make great quick breads our kids not only love to make, but eat too.